Glaucoma is a common disease of age, although it can develop in children and young adults. There are many sub-varieties of Glaucoma, but there are five main category types such as: Glaucoma Suspect, Primary Open Angle, Normal Tension, Chronic Narrow Angle, and Acute Narrow Angle. By definition, Glaucoma is defined as the progressive damage to the optic nerve in the eye. The most common misconception with Glaucoma is that it is considered a diagnosis if only high intraocular pressure (IOP) is present, which is not always the case. 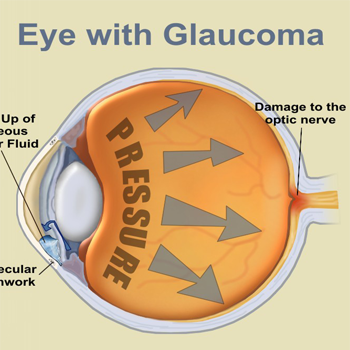 In fact, many Glaucoma cases have low pressure. It is for this reason that the work-up for Glaucoma involves numerous different analysis of the optic nerve and fluid outflow of the eye for proper diagnosis and analysis for Glaucoma progression. Of course, pressure is still a very important indicator that is typically used as a measuring tool for the disease, but its definitely not the only measurement used for diagnosis and treatment.